Painting in between the raindrops! We met for our final sketch outing last Saturday at Fakahatchee Strand Preserve State Park. 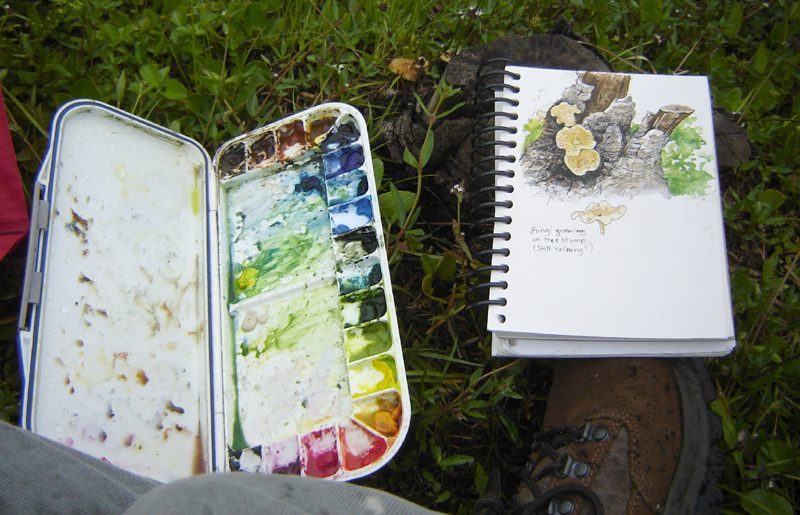 In spite of overcast skies and drizzling rain, we managed to explore a bit and do some nice studies. Luckily we had the use of a covered porch when we got too wet and chilled! Ink and watercolor fungi study (with a few splatters from the sky). 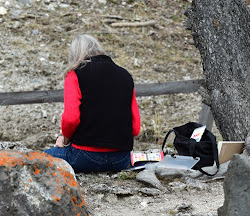 This month we met at a place within the northern area of the park, which was a change from the southernmost locations of our previous meetings. It was a good turn-out; artists worked with different media and enjoyed the strains of 15th and 16th century melodies played by a musical artist on her wooden recorder. We had a chance to explore a trail that bordered a wooded area of cabbage palms and wax myrtle. The edges of habitats are often the most interesting, and we saw a number of ferns, grasses, and blooming wildflowers in white, yellow, pink, and purple. 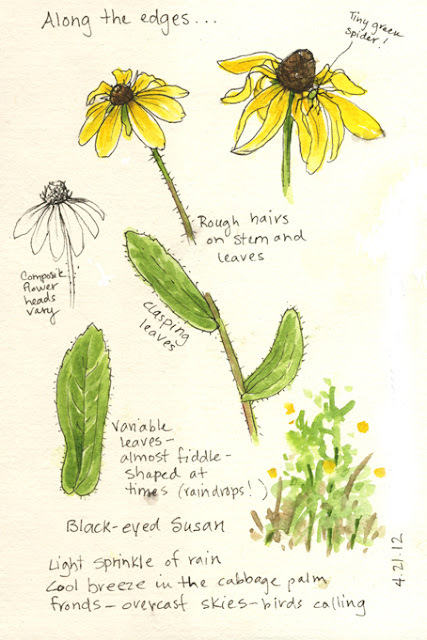 Black-eyed Susan wildflowers in ink and watercolor, quick sketches. Black-eyed Susan flowers (Rudbeckia hirta) were a glowing yellow against the deep green of dewy ferns. 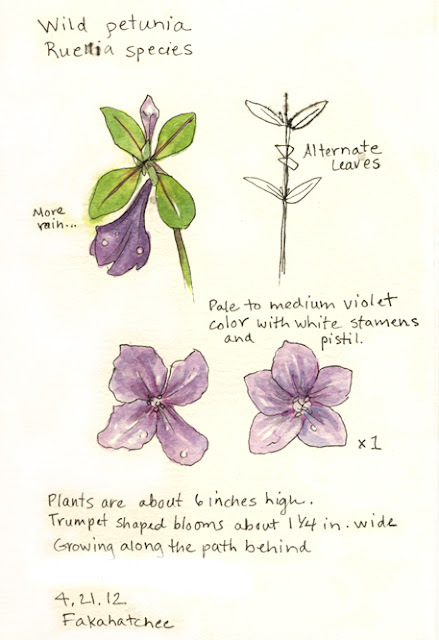 Closer to the ground were the violet-to-lavender trumpets of wild petunia (Ruellia sp.) drooping from the weight of the light rain. Pine pinks, a terrestrial orchid (Bletia purpurea), dotted the grassy edges with hooded blooms tinted a delicate pink, some plants already sporting their fattened seedpods. 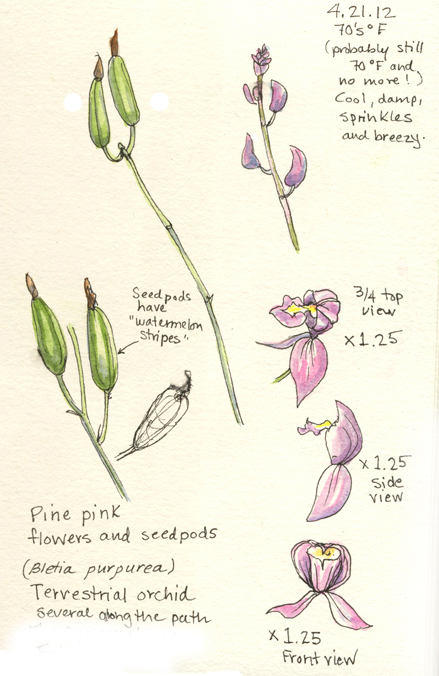 Pine pink, a terrestrial orchid, was plentiful along the wood's edges. Blooms are only about 1/4 to 3/8 inches. I think I could use some better glasses for close-up work! 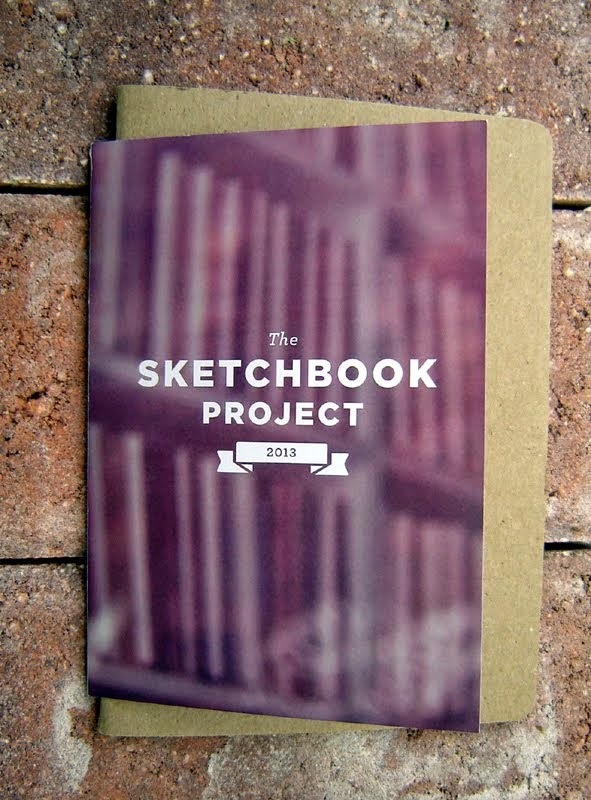 I chose to use my smallest sketchbook by Pentalic, only 7 by 5 inches, with the rationale that it would be easier to protect from the rain than a larger book. The upside is that I was able to do a series of small studies, rather than one large page. Ink and watercolor - I'm actually using a waterproof ink (Pitt Artist pens), but it's not waterproof until it dries! The smudges are from drawing into a rain drop on my page; then the ink blossoms into the waterdrop! I had a wonderful day in spite of the weather, and enjoyed being in the company of those who love art and nature. The fact that it was also Earth Day and the 35th Worldwide SketchCrawl made it special; being our last get-together for the year made it even more poignant. The good news is that the Park has given us approval for next year, so mark your calendars! 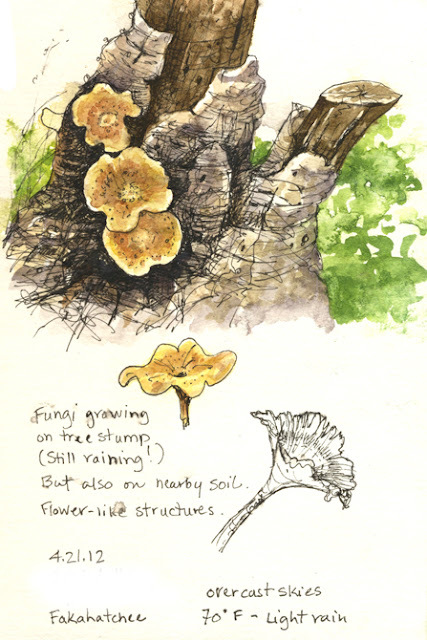 To view a slideshow of images from En Plein Air ~ Arts in the Fakahatchee, April 2012, please click below. Thank you to everyone who attended, and especially to Ranger Karen Relish for setting this up, giving us an historical overview of each location, and for answering all our nature-related questions. In spite of the rain, it sounds like a lovely day out. The music must have been delightful, too. I'm really looking forward to joining you in the Fakahatchee next year. Your little studies are sweet. Cheers! very nice post, you were able to get so many studies done! I liked your slide show too. Hi Sue, and thank you! It was a nice day in spite of the drizzly rain and breeziness. The music added a new dimension...really wonderful to hear those notes floating on the wind while we sketched. I'm already looking forward to next year. There's something special about Fakahatchee. Hello Mary! I'm so glad you enjoyed the slideshow - it's a way to share our day with those who couldn't make it or who live somewhere else in the world. This time I worked on small studies instead of landscapes - I was glad I chose the smaller sketchbook which allowed for a few more studies. Somehow I missed this post, Elizabeth. As usual, your art work is beautiful, and I loved getting a peek at your palette. I'm glad to hear you'll be able to repeat the experience next year. Thanks, Kathy! I need to catch up myself and I worry what I've missed :/ I was visited by a nasty spring (summer?) cold that no one should have. I love seeing others art supplies, too. One of the things I've enjoyed in our get-togethers at Fakahatchee was seeing the different papers, paints, brushes, pencils, and inks. Then there were the chairs - one of the artists had a great sketching chair (I NEED this one) that looks sturdy, comfortable, AND has an umbrella for sun or rain and a small table arm! Plus it wasn't as heavy as you'd think. Now I just have to find one out in the shopping world!